Recently I've been reading about the ensō as a spiritual practice. 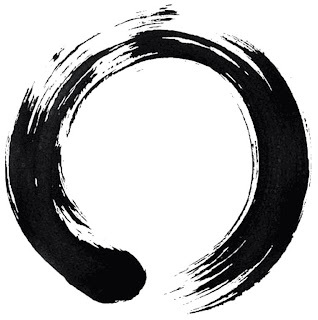 The word itself is a Japanese word that means "circle", although the ensō has become an expression of the moment and a symbol strongly associated with Zen Buddhist beliefs and the concept of emptiness. I read that some people practice painting an ensō daily as a spiritual or meditative practice. I would tend to think people who do this daily have more of an interest in Buddhist art than the average person. I have been thinking creating ensō on a daily basis. As I looked for advice on how to use the ensō as a spiritual practice, I found this interesting resource by Meredith W. McPherson that discusses the creative process behind calligraphy. Technically, the ensō is a symbol, rather than a character, but I believe the same principles apply. I like McPhereson's use of the acronym "respect" to describe the process. Here is a brief summary, although I highly recommend visiting her site for the finer details. Research: Research the meaning of the character. Etymology: Examine the changes in the character since its origin. Strokes: Study the formation and order of the strokes within the character. Practice: Repeatedly practice each character until you have trained your mind and your muscles . Emptiness: Empty your mind to allow the creative process to happen. Composition: Determine the essence of a character and visualize the opposing forces within that character. Transcendence: Impart your personal style. Very soon I will begin making ensō. I would like to do it on a daily basis, but sometimes life gets kind of busy, so I'll see how it goes. I think it would be very interesting to see how my ensō vary from day to day, depending on what is going on in my life. In the meantime, take a look at my Ensō Zine Swap. Doing crafts that have a meaning behind them brings me so much happiness because it is an opportunity to clear the mind and create something that reflects the moment. What are your favorite spiritual activities? Posted as part of Share the Joy. Seems there is quite a lot more to making an enso than I thought! Have you checked out Lynnette Monteiro's blog at http://108zenbooks.com/? She posts some pretty amazing daily enso's along with poetry and insight. Thanks for the comment on my blog about tea, I've just finished reading about the enso, fascinating. I also went over to look at your swap enso, and will be back to study this further. My son designed an enso and had it tattooed at the base of his neck. I hate tattoos, but his is lovely (considering).